Over more than a year and against the backdrop of a withering drought, about 50 Ventura County farmers, municipal water providers and environmental stewards put aside their traditional rivalry to launch an experiment in sharing the West’s most precious and contested resource. With Cal Lutheran economist Matthew Fienup leading the way, they created a new market where individual growers can buy and sell groundwater. The only exchange of its kind in California, the concept is drawing interest from water agencies as far away as Kansas. The United States Department of Agriculture has awarded a $1.9 million grant to expand the pilot project later this year. Rolled out as a pilot program in January, the market caps how much water a grower can pump to irrigate crops. The system rewards conservation by permitting farmers to sell their surplus to another user who is running on empty. And when the resource grows particularly scarce, as in times of drought, sellers can ask a higher price. That helps repay them for the costs of installing more efficient irrigation systems. When “an academic from the ivory tower meets guys with mud on their shoes,” things don’t always go well, said John Krist, CEO of Farm Bureau of Ventura County. But Fienup, a specialist on local land use policies who serves as executive director of the Center for Economic Research and Forecasting, quickly grasped the complexities of farming on the Oxnard Plain, among the priciest and most fertile farmland in the world. “Matt is the animating force behind the whole thing,” Krist said. 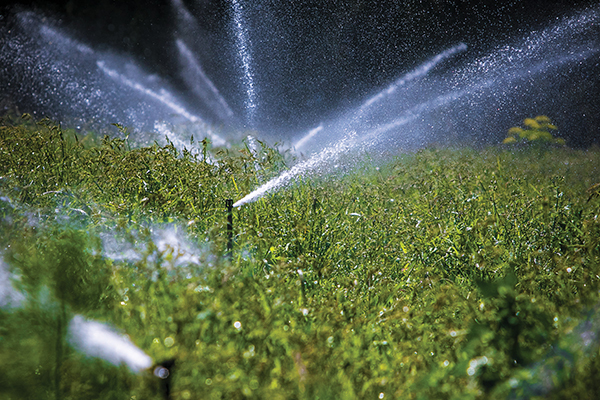 The idea for the water market flowed from a conversation between Fienup and Edgar Terry ’81, MBA ’83, a fourth-generation farmer and senior adjunct professor of finance at CLU. Terry’s credibility in the local ag sector opened doors for Fienup, a 42-year-old former rock-climbing instructor and adventure photographer. “I ate chicken pot pie at every country kitchen in the county,” he said. The farmers he met embraced the idea of a water market, but almost to the person they told Fienup the regulators would never allow it. Terry and Krist then set up one-on-one meetings with board members of the Fox Canyon Groundwater Management Agency, who oversee aquifers beneath the Oxnard Plain. The need to collaborate intensified in late 2014 after the state legislature passed a law requiring most water basins to assemble stakeholders and devise a sustainability plan. To meet this mandate, the Fox Canyon Water Market Group was formed with Fienup chosen as the chairman, in part because of his affiliation with Cal Lutheran. The university was seen as a neutral party with no financial stake in the outcome, according to Krist. Terry took on the vice-chair role. For seven months, the group met bimonthly in a classroom at Cal Lutheran’s Oxnard center. Representatives from a pioneering Australian water market provided nuts-and-bolts guidance on how to build the exchange from the ground up. The County of Ventura sponsored a website where members could share information. Things did not always flow smoothly, Fienup notes. But the parties worked through their strong disagreements bit by bit, until the plan was approved unanimously. To keep everyone honest, the farmers themselves specified each market member install a high-tech device with a solar-powered cellular modem that monitors in real time the quantity of water they are using and sends that data to the cloud. Cal Lutheran’s economic forecasting center was selected to administer the exchange. Rolling out the pilot program after a record-rainfall winter has had one drawback. So far, none of the early adopters has needed to initiate a trade. A larger, yearlong test of the market that will expand to include municipal water agencies and environmental users will begin in October. The Nature Conservancy, one of the stakeholders that provided input, will administer the $1.9 million federal Conservation Innovation Grant funding this next phase. Krist, who has headed the Farm Bureau for nearly a decade, observed the heaviest lift for Fienup and the working group was not figuring out how trades would work or procuring the technology to monitor usage. Colleen Cason is an award-winning journalist and longtime columnist for the Ventura County Star. A Thousand Oaks resident, she has served as adviser to The Echo student newspaper and currently edits Central Coast Farm & Ranch magazine.